This tutorial will teach you how to peel, seed, slice and roast butternut squash in a variety of ways. 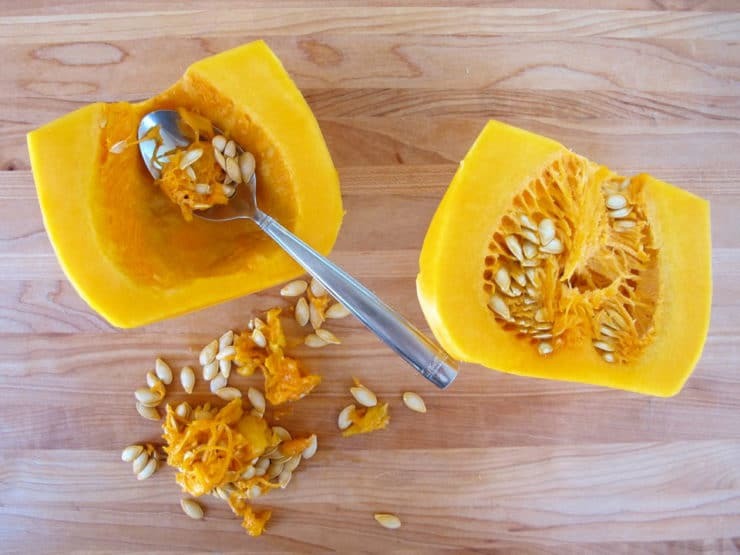 Save money by prepping this hard winter squash yourself, then toast the seeds for a crunchy salty snack! In addition to a step-by-step photo tutorial, I have also provided a how-to video and links to some of my favorite butternut squash recipes below. I know that tough-skinned butternut squash might seem daunting at first, so I have also added some tips for those with limited arm strength. 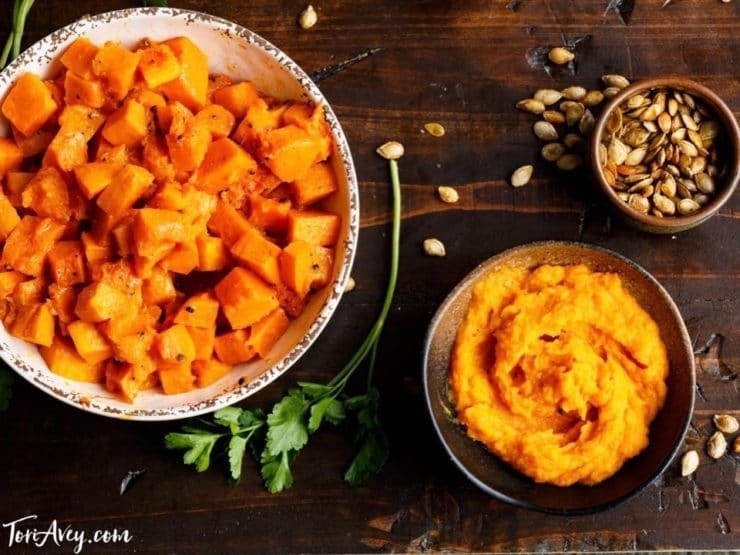 Cooking butternut squash is easier than you think! With the fall season here, winter squash varieties line the produce shelves. Winter squash are different from summer squash (like zucchini and yellow crookneck)—the skin is hard and inedible, while the inside is firm and flavorful. Winter squash are allowed to mature on the vine, then stored for use in winter. Because of their tough outer shell they keep well for long periods of time. There are some squash that qualify as both summer and winter; when harvested early, they are summer squash, but if left to mature on the vine they develop a hard outer shell and become winter squash. Butternut squash is one of my favorite winter squash varieties. It belongs to a species known as C. moschata., a group of squash that also includes the Winter Crookneck, the Cushawsome, and some varieties of pumpkin. 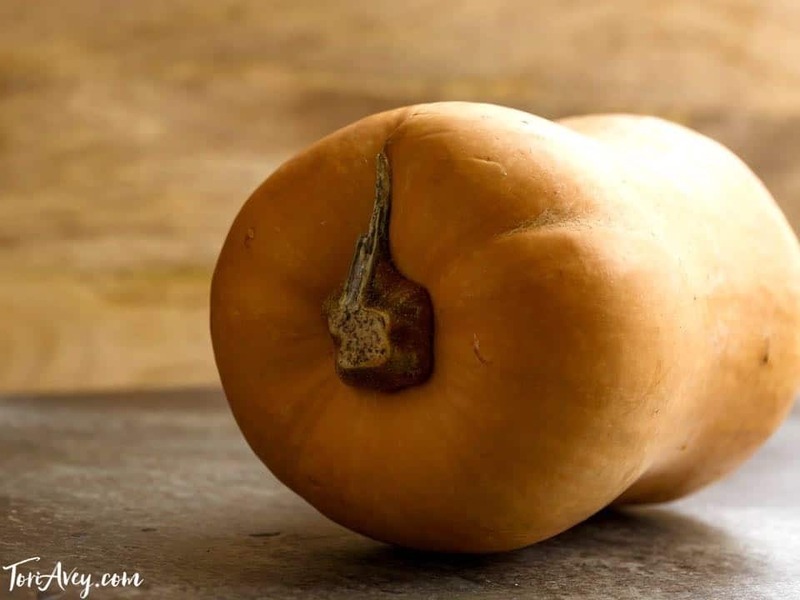 Butternut squash, like all squash, has ancestry in North America. Archaeological evidence suggests that squash may have first been cultivated on the isthmus between North America and South America (known as Mesoamerica) around 10,000 years ago. Squash was one of the three main crops planted by Native Americans, known as the “Three Sisters”– maize (corn), beans, and squash. Winter squash was prized by the Native Americans and early American settlers for its long shelf life. The most popular and widely available butternut squash is the Waltham Butternut, which was originally cultivated in Massachusetts. Butternut squash is very nutritious. The flesh is full of vitamins A and C, and it has a naturally sweet flavor that really emerges when roasted. The seeds are packed with protein and heart-healthy fats. 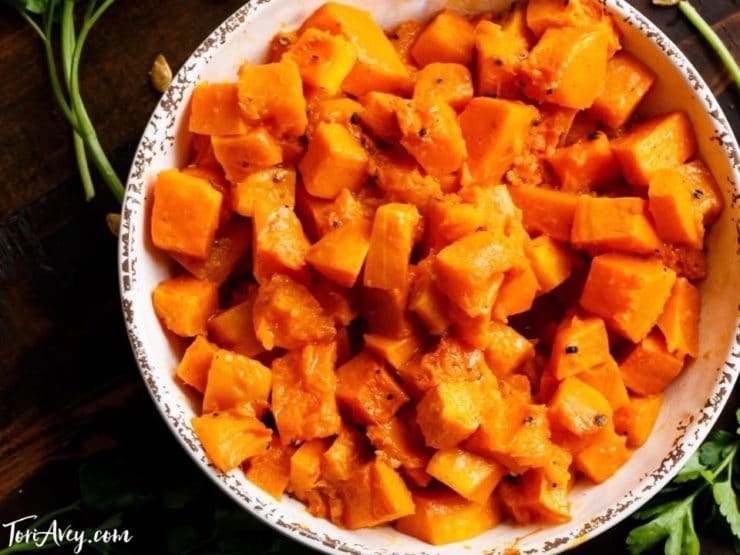 It’s a delicious seasonal squash that can be cooked in a variety of ways– baked or roasted, in a puree, in soups or stews, and as a sweet addition to other hearty winter dishes. 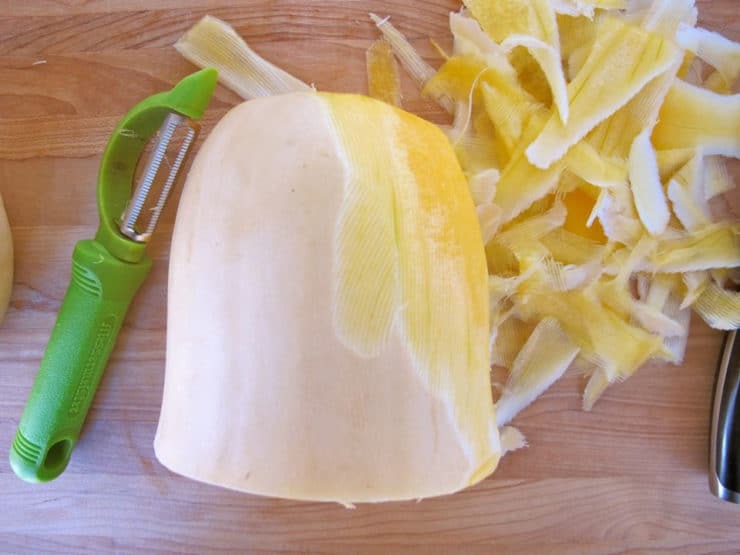 Preparing a hard-shelled butternut squash can seem intimidating, but it doesn’t have to be. I’ve given you a step-by-step tutorial below that will teach you everything you need to know. Doing the prep work yourself will save you a lot of money compared to buying the pre-peeled and diced variety, which can run you upwards of $5.99/lb at my local grocery store. Compare that to $1.49/lb for the whole squash variety, and you’ve got a very significant savings—the pre-cubed costs over four times more! Seems kinds of crazy, when you consider that peeling and dicing a whole squash should only take you around 10-15 minutes. I’ve also shared instructions for roasting butternut squash seeds. They’re smaller and more tender than pumpkin seeds, and are every bit as delicious when roasted (in fact, I like them even better than pumpkin seeds!). 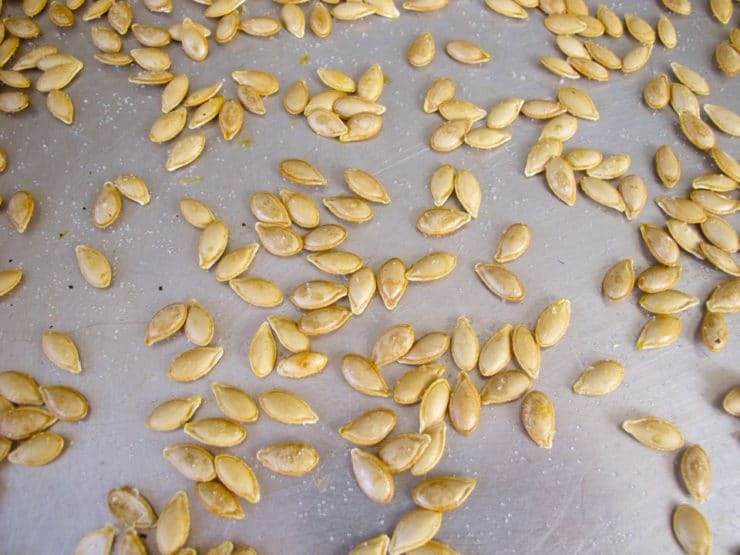 When I was roasting pumpkin seeds last year, I learned a tip from Elise Bauer at Simply Recipes—boil the seeds for ten minutes in salted water before roasting. 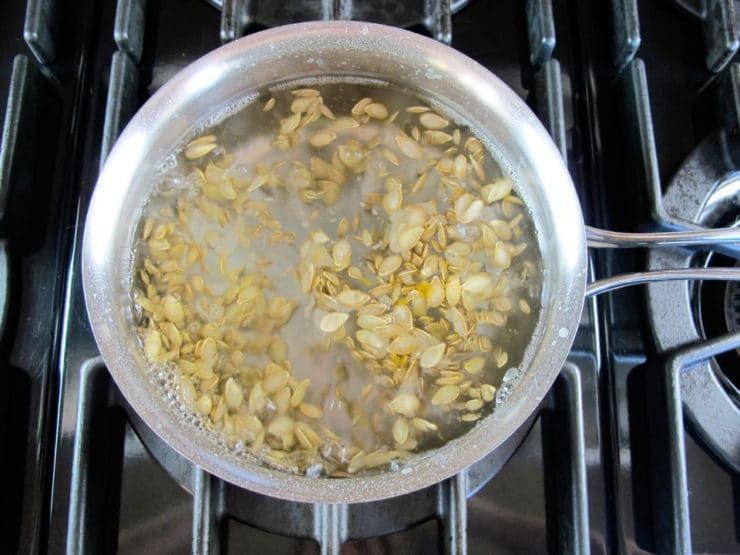 This extra step really helps the shells toast up crisp, and it also makes the seeds more digestible. I’ve used the tip when toasting butternut squash seeds, and it works the same way. Thanks Elise! From choosing to peeling to slicing to seeding to roasting, by the end of this tutorial you’ll be a butternut squash pro! 6 servings per 2 lb. How to peel, seed, roast and prepare hard-skinned Butternut Squash, and how to toast the seeds. Butternut squash is seasonal. In the U.S., the best time to buy ripe local squash is September through October. It may be available at other times throughout the year as an import. 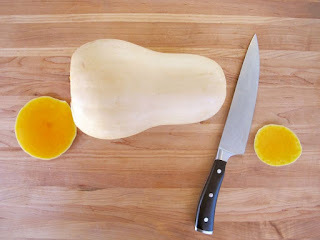 Look for butternut squash with a solid beige color, without any deep cuts or bruises. A little surface scratching is normal. Choose squash that feels heavy for its size. Avoid squash with brown patches or punctures, which can introduce bacteria and mold. Butternut squash will keep in a cool, dark part of your kitchen for several weeks-- it does not need to be refrigerated. How Much Butternut Squash Should I Buy? 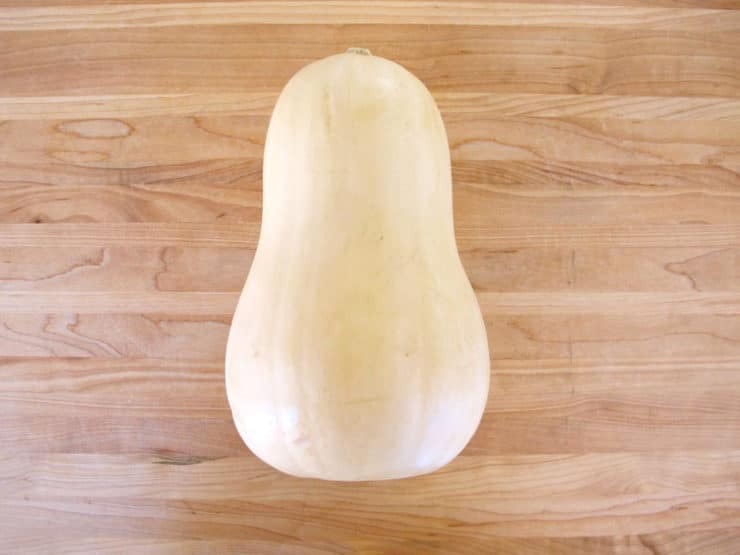 Mature butternut squash comes in sizes ranging from 1 to 5 lbs. The average butternut squash will be around 2 to 3 lbs. 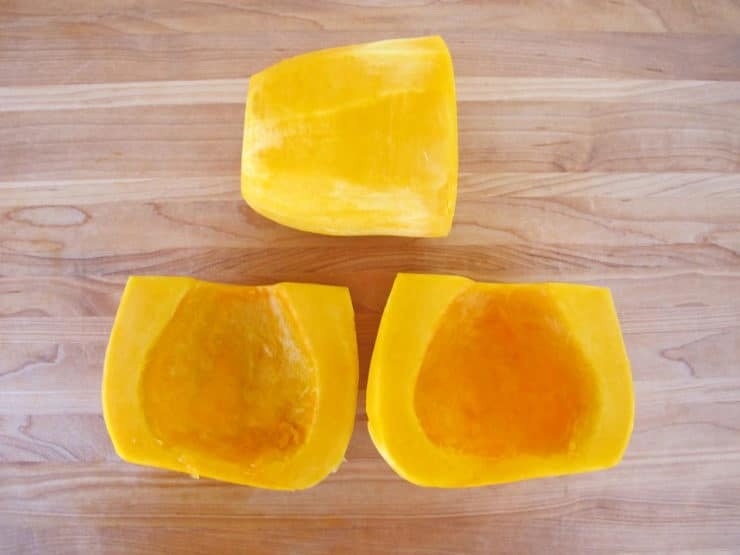 After peeling and seeding, your squash will lose 2-3 oz of weight. For example, a 3 lb squash will yield about 2 lbs 13 oz of flesh. 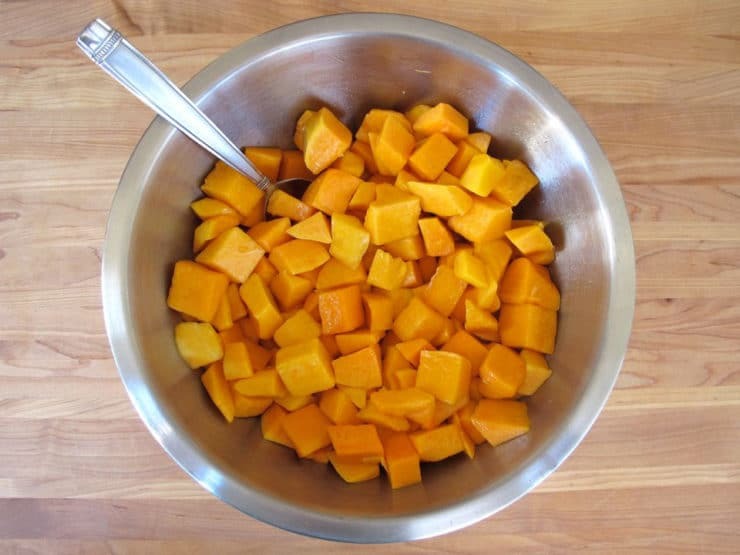 This is helpful to know for recipes that call for a certain amount of diced, peeled squash—if your recipe calls for 2 lbs of diced squash, you’ll want to look for a squash that is around 2 lbs, 3 oz in weight. Note: If your hands are not very strong, or you don’t have a sharp paring knife or serrated peeler, you can microwave the squash before you begin peeling to make the process easier. Pierce the squash a few times with a fork, then microwave for 2 minutes. This will soften the skin connection and make the peeling go faster. 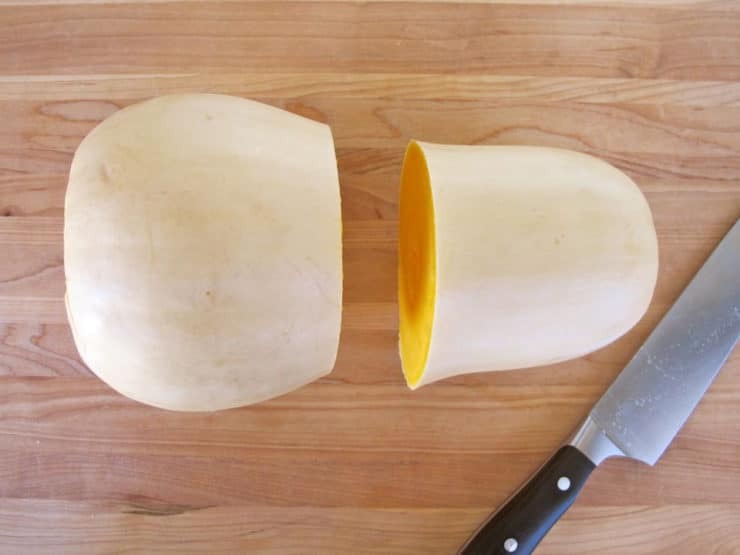 Slice off the stem and bottom ends of the squash, so that both ends are flat. Slice the squash in half, just where the thinner end begins to widen around the middle. Turn each half so that a flat end rests against the cutting board. 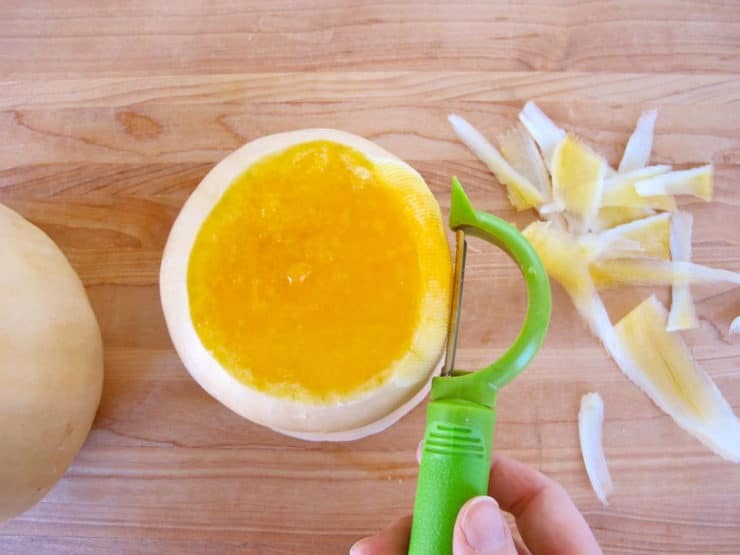 Use a sharp serrated peeler or paring knife to peel off the skin in downward strokes. You will notice light green lines emerging beneath the skin as you peel. You want to make sure to peel all of those green lines away from the squash—they can be tough and fibrous. The squash isn’t completely peeled till all of those green lines have disappeared and the orange flesh remains. 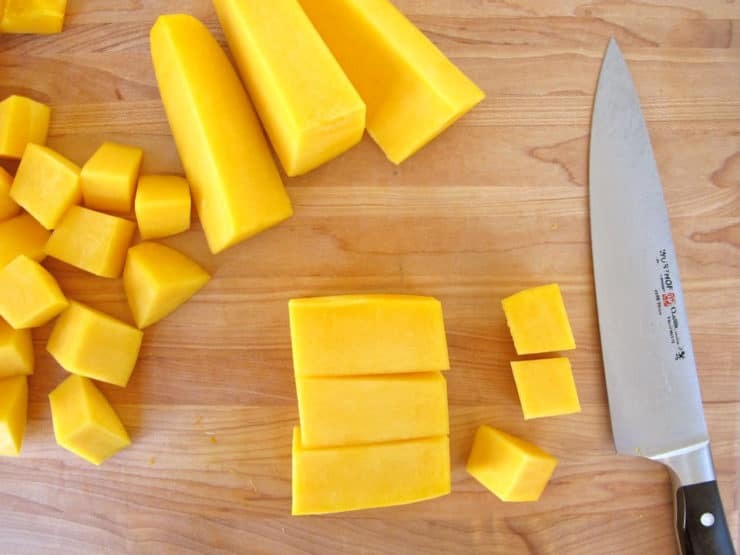 Now you have three sections of peeled squash, which you can slice or dice depending on your preference. I usually dice the squash into 1-inch cubes, which helps it to cook faster and more evenly. There are two ways to roast butternut squash—skin on, and skin off. It’s easiest to roast skin on, that way you don’t need to deal with peeling. 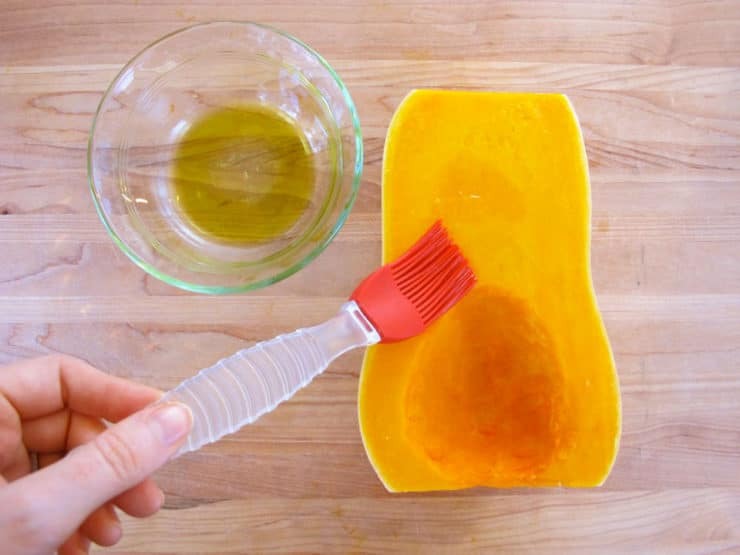 This method words best if you are planning to make a butternut squash puree, or you simply want to scoop out the cooked flesh and you’re not worried about the presentation. To roast skin on, preheat oven to 400 degrees F. Slice off the stem and bottom ends of the squash so that both ends are flat. Set the squash on a cutting board with the widest cut end flat against the board. Use a heavy chef’s knife to cut the squash from top to bottom, slicing it in half vertically. This may be difficult depending on how strong or sharp your knife is, or how big and thick your squash is. Take your time. If you encounter some resistance, you can tap downward on either end of your knife blade with a rubber mallet to slowly move it along. 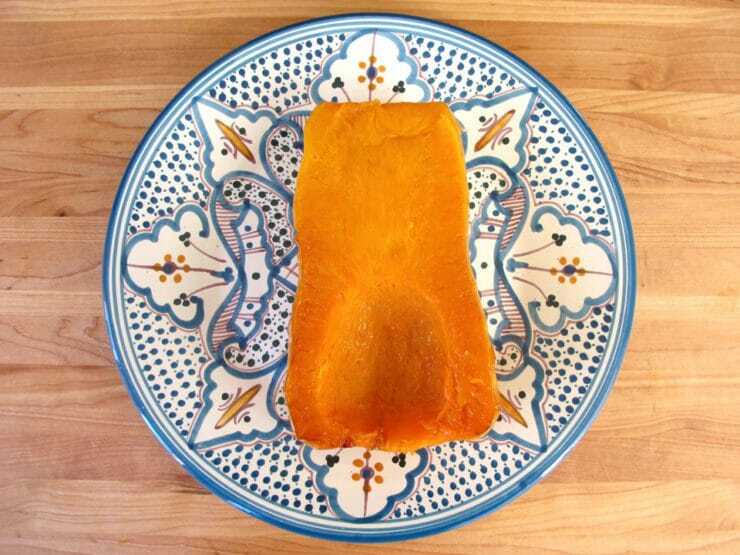 If you've pre-microwaved your squash, the slicing should be easier. 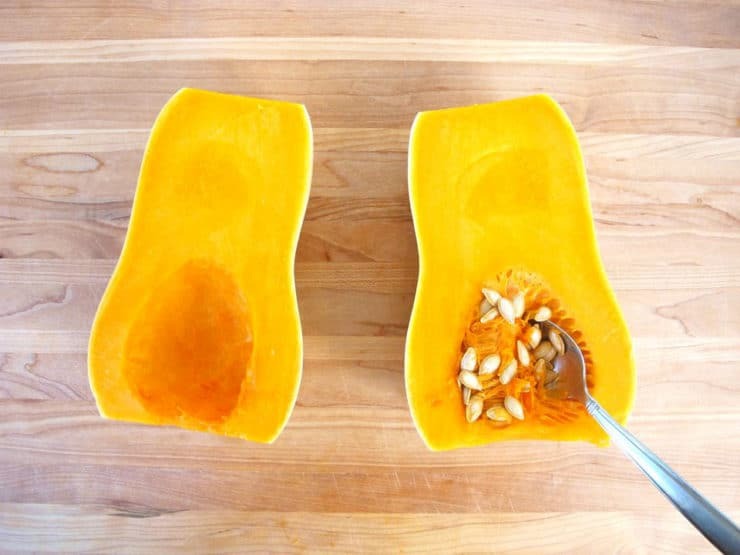 Once you’ve sliced the squash in half, scoop out the seeds with a metal spoon. Reserve them for roasting, if desired. Brush the cut surfaces of the squash with olive oil. 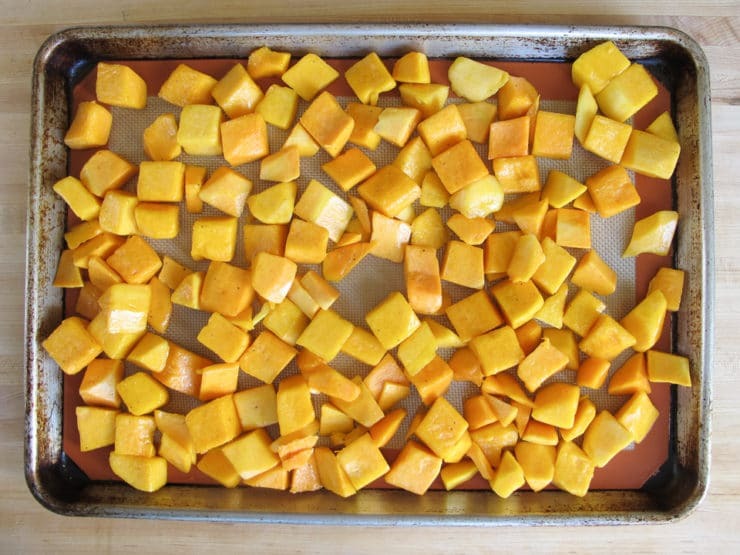 Place the squash halves cut side down onto a baking sheet. Roast the squash for about 1 hour, turning the sheet once halfway through cooking. Start checking for doneness around 45 minutes—smaller squash will cook faster. It will take a full hour or longer to cook a 3 pound squash. The squash is done when the flesh is tender all the way through to the skin. The outer beige skin will be slightly blistered and browned. The inner flesh will be dark orange, soft, and caramelized around the edges. 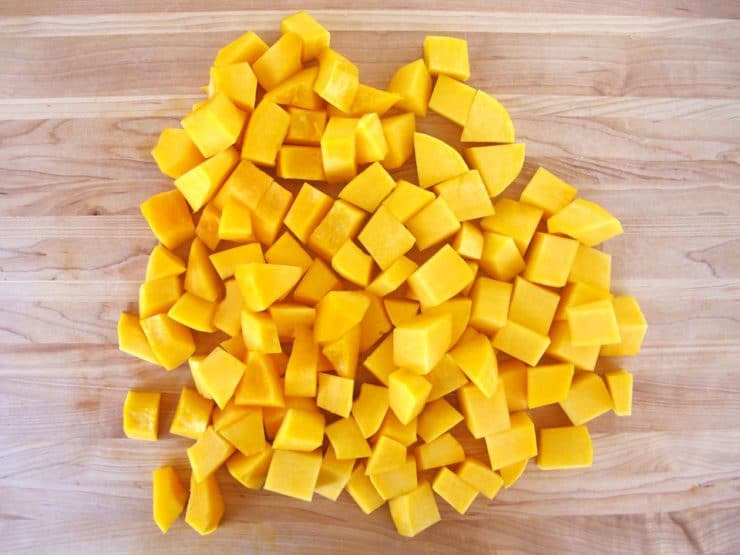 The easiest way to roast squash that has already been peeled is to dice it into 1-inch cubes. The smaller size will help the squash to roast more evenly. Preheat oven to 400 degrees F. Place the cubes into a large mixing bowl and toss with 1-2 tbsp olive oil (I use about 2 tbsp for a 3 lb. squash). You can also toss it with minced garlic, if you’d like. 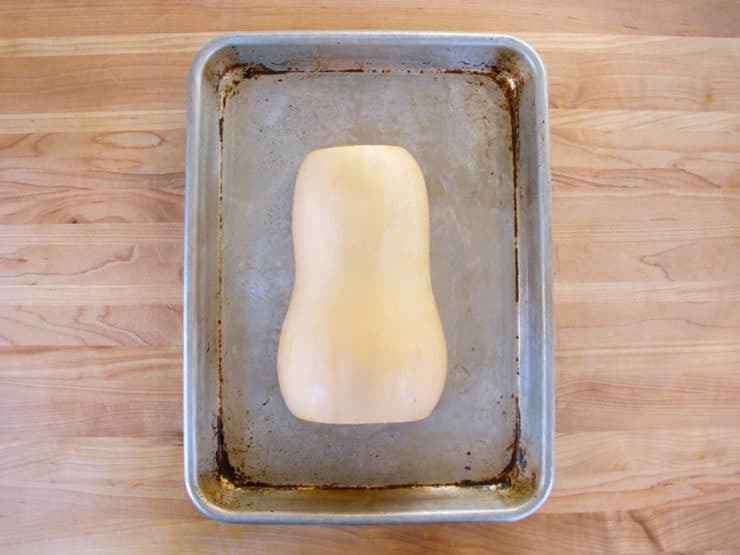 Spread the squash out evenly across 1 or 2 baking sheets. I like to line the tray with a silpat for easy cleanup. Sprinkle the squash with salt, pepper, and any other seasonings you like. Roast the squash for 30-40 minutes, stirring once halfway through cooking, till the largest pieces of squash are fork tender. A 3 lb squash will produce about 1/3 cup of cleaned seeds. Preheat oven to 325 degrees F. Place seeds and pulp into a mixing bowl. Cover the seeds with water. 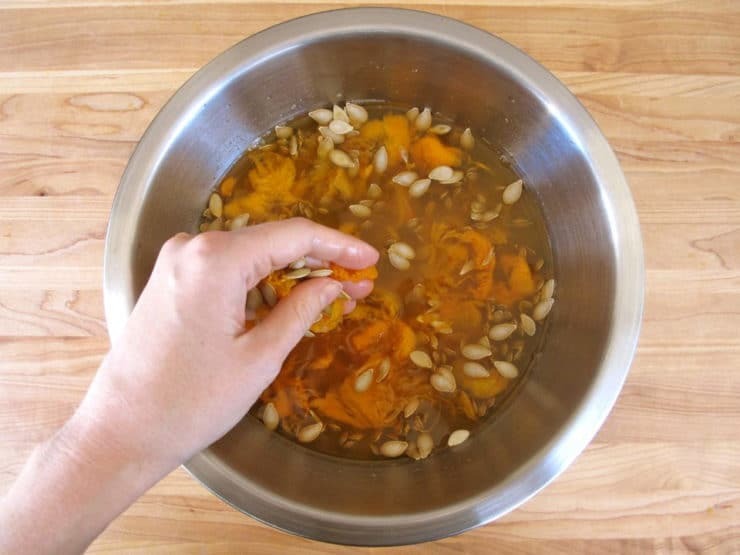 Use your fingers to separate seeds from the fibrous butternut squash threads. It is easiest to do this underwater. 2. Drain the seeds in a colander. Pick through the seeds and discard the loose orange squash threads. 3. Bring 1 quart of water and 1 tsp of salt to a boil. Add the seeds (up to 2 cups of seeds per quart of water) and boil for 10 minutes. 4. 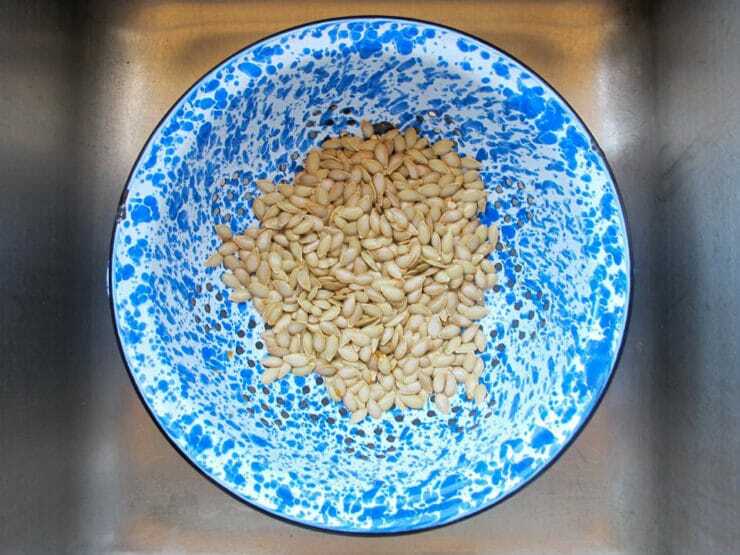 Drain the seeds in a colander and pat dry with a paper towel or towel. A few seeds will stick to the towel as you dry, just use your fingers to brush them back into the colander. Pour the seeds into a mixing bowl and toss them with a little olive oil or melted butter. I use about 1 tsp of olive oil or 2 tsp of melted butter per 1 cup of seeds. 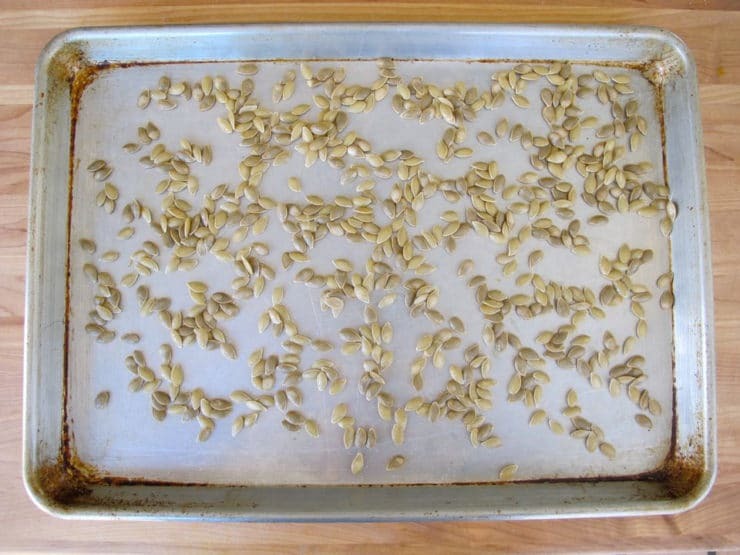 5.Spread the seeds out in a single layer onto a baking sheet. Season with salt and any other seasonings you like. Smoked paprika, cinnamon-sugar, nutmeg, chili powder, or cayenne (spicy!) will all work well. I prefer my seeds simple, with a generous sprinkling of salt. 6.Toast the seeds in the oven for about 20 minutes, watching carefully to make sure they don’t burn. They won’t change color much (if they turn too brown they’ll be over-done), so the best way to check for doneness is to taste them. I’ve found that once I hear a few seeds “pop” like popcorn in the oven, that’s the perfect time to take them out. Don’t let them stay in much longer after that first “pop,” or you risk burning them. 7.The seeds end up crispy and delicious, with a flavor similar to fresh popcorn. Delish! how to freeze runner beans?